Note: All sites with horizons nearer than 1 km. (as here) must be treated with caution. This applies particularly to these two sites. Having said that these results are offered for the record. 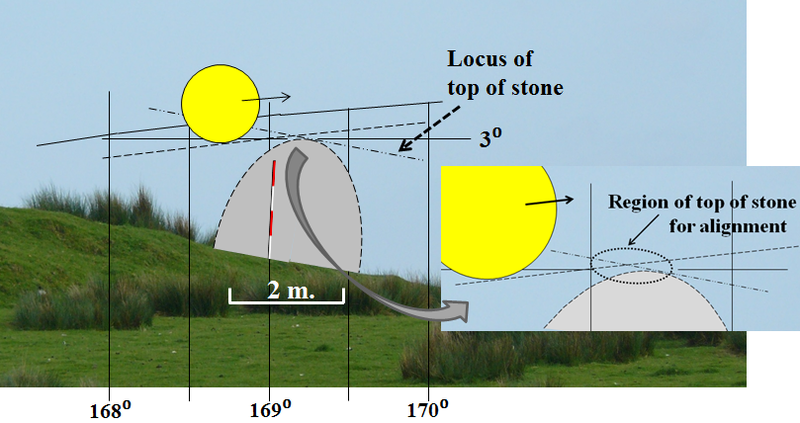 While vegetation interferes, the top of the Foresight Stone is visible from the Backsight stone. Lateral movement. When the moon is in the south, its path is relatively 'flat' and so the declination observed becomes relatively insensitive to changes in observing position. (OP). 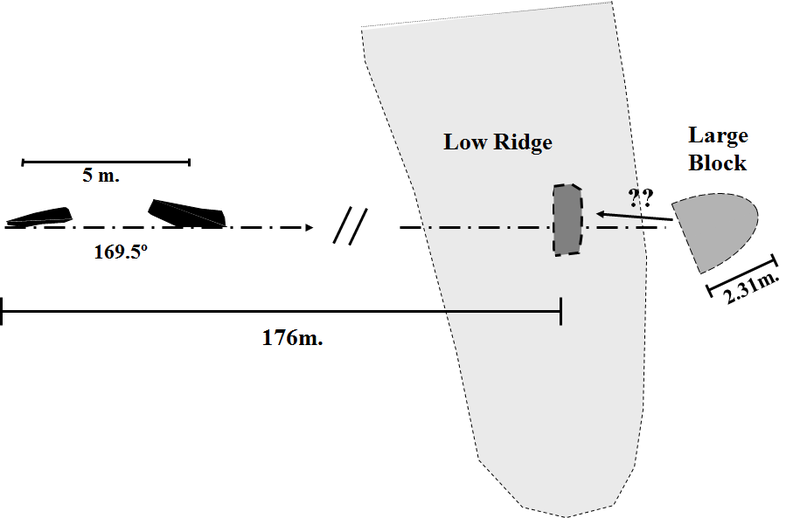 To achieve a precision of 1' of arc, the OP left/ right would need to be correct to about 0.35m. or a little over a foot. The grid results suggest that an OP close to #1 or #4 is most likely with #3 & #6 unlikely. This is consistent with the fallen stone's present position, though knowledge of the stone hole position would be useful. The declination is much more sensitive to changes in elevation; particularly so with the moon in the south. Consistency by the observer(s) would be important, particularly during any given standstill. (See note). Height of eye would be important but this must have been appreciated by anyone who was capable of setting up such an alignment. 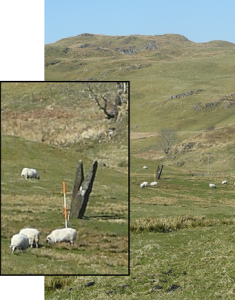 Two stone slabs ( 2.4m x 1.2m x 0.4m and 2.3m x 1.5m x 0.4m ) on open ground about 0.5km west of Carnasserie castle. The southern stone leans slightly to the east. The line of the west sides at ground level is close to 170°/350°. There can be no alignment to the north. To the south the horizon in the indicated direction is close. 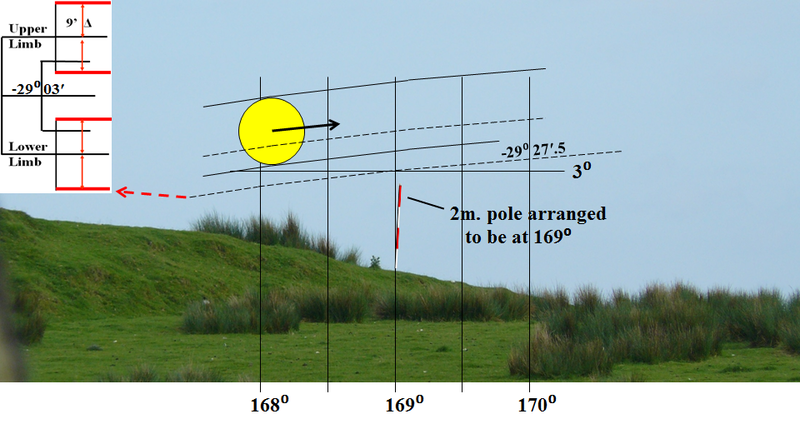 Less than 180m, where there is a 'whaleback' ridge about 100m long oriented about NE to SW with the indicated point on it towards the SW end. At this point and just over the hidden south side of the ridge is a large shattered (fallen?) block. 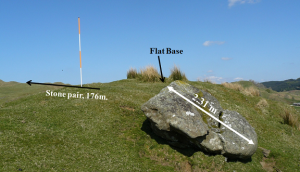 The ridge is composed of friable rock with only a thin (5cm) covering of turf on it, and the block has what appears to be a flat end (base?). It seems possible that it once stood on the ridge. 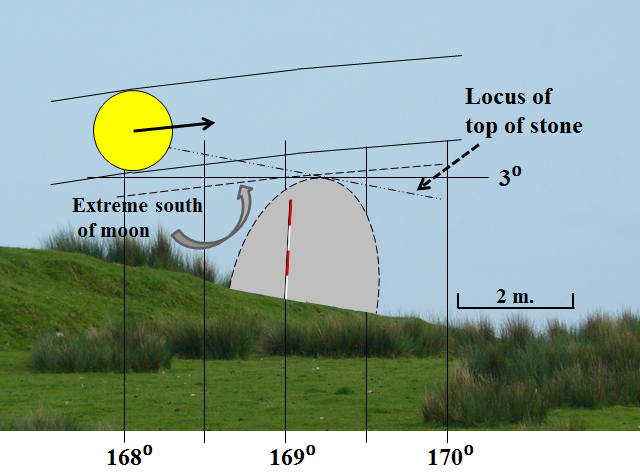 If the block (2.65m high, 2.8m wide, 1.0m thick) had sat on the ridge as suggested (at 176m) then measurements show that the top of it as viewed from just behind the stones would be an alignment for the extreme southern declination of the moon providing the sighting height was controlled. Assuming that the stone/ block once stood on the rocky ridge, then the exact position would be important. All that we can do is to show the range of location where it would be necessary to have stood for a presumed eye height (1.5m. ) and in order that the declination of the top of the stone was within ±2’ of arc of a key theoretical value. 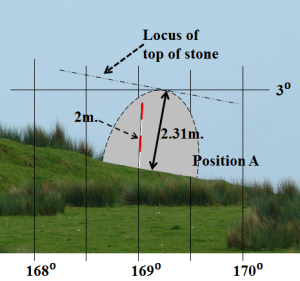 Based on the requirement that a precise alignment should be within 2′ of arc of a theoretical value, the top of the stone would need to be in the range shown above. i.e. between 169°.0 and 169°.25 which corresponds to a distance of 0.8m. - based, of course, on the assumption of eye height of 1.5m. A change of eye height of 10cm. would give a change of 2′ of arc. 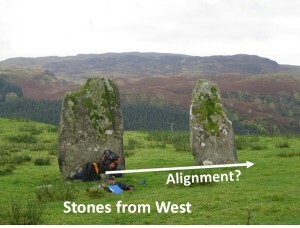 It must be noted that the fallen stone is not exactly in line with the possible position shown above, but is about 1 m. to the right. The top rather less at about 0.5m - the stone may have slewed slightly in falling. Lunar visibility. The 3rd quarter moon would be rising in near darkness or deep twilight. However for the 1st quarter moon the sun would not yet have set. It would have been low in the western sky but behind a steep hill close by to the west. Thus observations at this time would probably have been possible. (1) On the assumption that the observers were interested in the time (i.e. day) of the maximum (or minimum) of the 'wobble', then the actual position (now we would say declination) of the moon during this time would not have been of great importance. 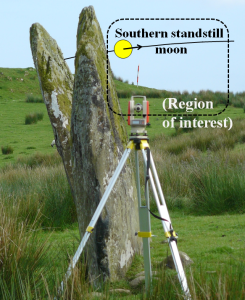 At a site such as Achnabreac or Carnasserie, as long as the observers were consistent with regard to observing position, it would matter little if they had the moon a little too high or a little too low. (2) Bearing in mind what is said above, it is suggested that such a short alignment would only be a practical possibility for the moon in the south. Both are close to Nether Largie, a site for which Thom provided evidence for the belief that it was a lunar observatory. 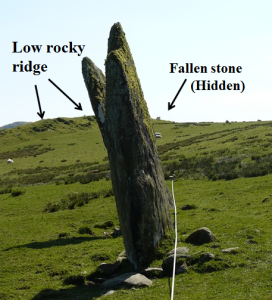 Re the Carnasserie presumed fallen stone, there are no other stones of significant size nearby.